I love peonies - for a variety of reasons. The blossoms are glorious, huge and so easy to create contemporary flower arrangements with. After they bloom, the deep green foliage looks great in the garden as a backdrop for the rest of the season. The deer don't eat them - ever! But it seems that they bloom in full glory the day before a major rain event every year. And their full blooms soak in the water, catching it and holding it in the bowl shaped flowers. And then, one by one, the blossoms become top heavy and snap. After the storm, I am left with tons of flowers with destroyed stems that need to be picked, too many for bouquets. Out of plain kitchen trash bags, I made raincoats for my peonies. Before Tropical Storm Andrea descended upon us with torrents of rain, I pulled the trash bags down over the flowers. And they survived. And when the rains returned yesterday, I again covered them. 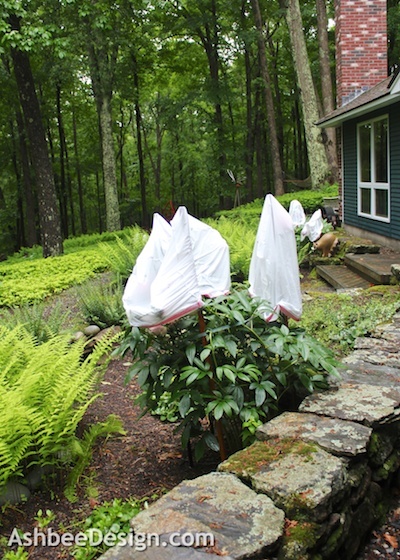 My front yard looks like a ghost convention! But when the sun returns, I'll uncover the peonies and enjoy the flowers a little longer. A simple solution for sure. And the trash bags are still intact and will be used for their intended purpose. Ha! Great solution and I sympathize - I have the same problem with my Annabelle hydrangea. Same thing - bad storms the minute it blooms. My solution - I put up a large beach umbrella to cover it! Maybe I should invest in a beach umbrella as well. Certainly would be easier!